- Minimum CGPA of 3.00 from recognized university. - Proven records in extra-curricular activities and or/social community services. - Evidence of good interpersonal communication, leadership skills. - No financial assistance from other agencies. a) Full scholarship: covers tuition, living expenses and full waiver on all registration and annual fees. b) Bursary: covers tuition fees only. This Award is not transferable and not redeemable for cash. The Recipient is required to fulfill the following conditions. 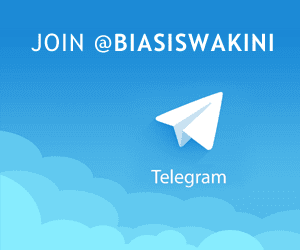 Failure to strictly observe the conditions contained herein will entitle Yayasan Cemerlang the right to automatically withdraw the Award without notice. 1. The recipient must not commit any unlawful act(s) or offence(s) punishable by law, or any form of misconduct, in breach of the university’s rules and regulations. 2. The recipient must not do anything, verbally or otherwise, which could tarnish Yayasan Cemerlang image. 3. The recipient must maintain a study load as prescribed for the long and short semester. 4. The recipient must maintain a Cumulative Grade Point Average (CGPA) of 3.0 every semester. 5. The recipient must not engage in or be involved in any misconduct or improper or immoral behavior. 6. The recipient is not allowed to defer or postpone his/her studies without the written approval of the Dean. Where approval has been obtained, the recipient must submit a copy of the written approval to Yayasan Cemerlang. 7. The recipient must at all times observe and abide by the university rules and regulations, which may be changed at any time or from time to time. 1. To enrich the learning experience, the recipient may be required to teach or conduct tutorials at a level for which he/she is eligible to do so. 2. The recipient may be required to organize or lead some university related activities. 3. The recipient is required to achieve the required English proficiency level before graduating. 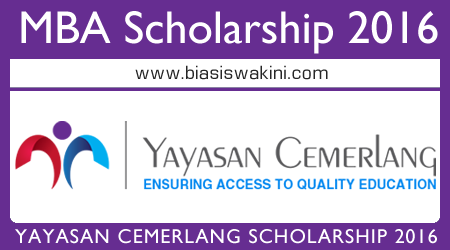 How to Apply Yayasan Cemerlang Scholarships 2016? 0 Komentar untuk "Yayasan Cemerlang MBA Scholarship 2016"